The RIU Vallarta invites singles, couples, families, honeymooners, and large groups to soak up some rays, indulge in a task cocktail, and enjoy the seemingly endless amount of sunshine in Puerto Vallarta, Mexico. RIU Vallarta is located within nine miles from downtown Puerto Vallarta and in close proximity of several other RIU Resorts (for example: RIU Palace Pacifico, RIU Jalisco). Among all the Puerto Vallarta all-inclusive resorts, the RIU Vallarta is considered to be one of the most luxurious and spacious. While you vacation in the Puerto Vallarta area of Mexico, you’ll want to have all the amenities of a five star resort at your fingertips. The relaxing vacation you deserve! Every single resort that is located in Puerto Vallarta, Mexico is going to have something spectacular to offer its guests, but the RIU Vallarta is one of the few that does so in the most luxurious of fashions. You’ll feel as if you’ve walked into your own private beach front mansion, for the amenities, staff, and rooms are truly unbelievable. If you’ve never experienced a true upscale all-inclusive Puerto Vallarta vacation, then maybe it’s time you do. With all-inclusive packages that are affordable for every budget, it has never been easier to impress your friends and family during your next beach vacation. And for a limited time (1/2-12/23/15), two kids 12 and under will stay and eat for free in select room categories, which will save you money while you vacation in Puerto Vallarta, Mexico! 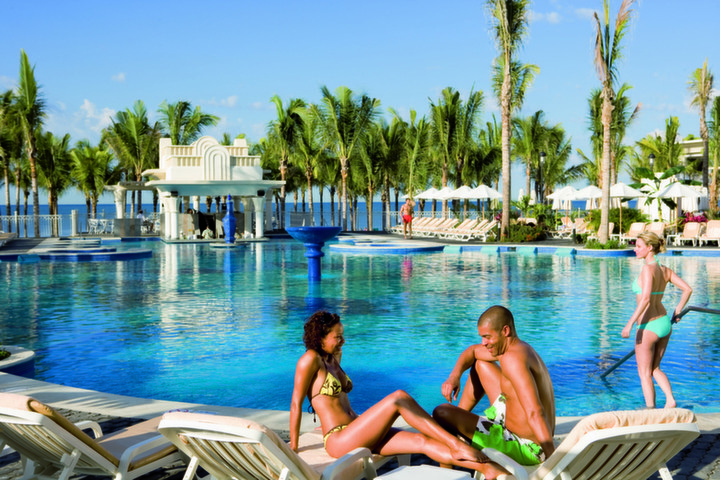 The RIU Vallarta Resort is one of the more family friendly resorts in Mexico, enabling families and groups with small children to have a once in a lifetime experience during their all-inclusive vacation. 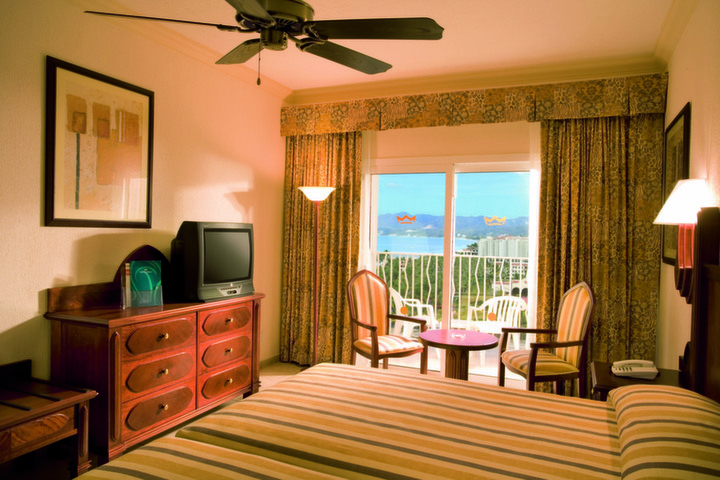 Kid’s can enjoy ample amount of pool and beach time while you and your spouse get some much needed alone time. When you vacation to Mexico, you’ll definitely want to be located near the beach and luckily for you the RIU Vallarta is right on Great Flamingos Beach in Nuevo Vallarta. Guests are welcome to enjoy a variety of different non-motorized water sports like, snorkeling, kite surfing, paddle boarding, and much more. Not a beach person? No worries! The RIU Vallarta has two enormous swimming pools that are spacious enough to fit hundreds of people without feeling overcrowded or crammed. The large, adult-oriented pool features jetted areas, swim-up bar, and in-pool lounge chairs and bistro tables for ultimate comfort. There’s also a spacious children-oriented pool with three wicked waterslides, volleyball net, and more pool safe activities for the youngsters to enjoy. It’s hard to say who’s going to have more fun during their vacation to Mexico. As Dad floats on a plush pool chair, or the kids swirl down the rapid waterslides and win games of pool volleyball; it is sure to be a vacation that will be remembered for years to come! 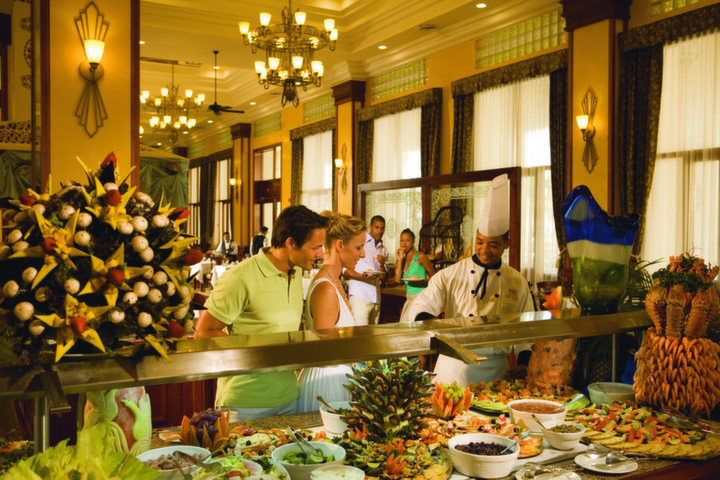 The RIU Vallarta has four incredible restaurants that serve up some of the most premier cuisine in the area. For those super picky eaters, the all you can eat buffet-style restaurant is sure to have something that suits your fancy (the buffet offers a special theme dinner twice per week, so look out for that!). If you are looking for a more gourmet dinner, then try Nirvana, the Asian Grill and Steakhouse for an a la carte and buffet choices or Sir George for a crystal chandelier, antique style gourmet meal. Also, snacks are available 24-hours a day at select restaurant. But don’t forget about drinks! This resort includes five bars, a swim-up pool bar, both which serve unlimited drinks all day and night. The shear architectural quality of the RIU Vallarta is truly incredible and with an art deco-style interior, guests are speechless as they walk into this luxurious resort. For example the lobby is decorated in a formal, black and white style design, adorned with stain-glassed accents, and the towering chandelier adds a consistent balance of opulence to the resort’s design. Although the lobby entrance and majestic fountain of the property offer spectacular features, the spacious rooms and cleanly atmosphere are the two factors that really tie this resort together. 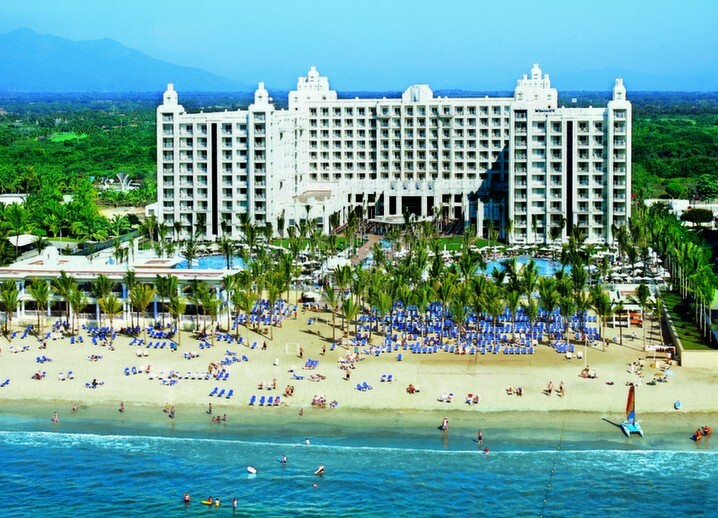 Book your Riu Vallarta Getaway in Puerto Vallarta! 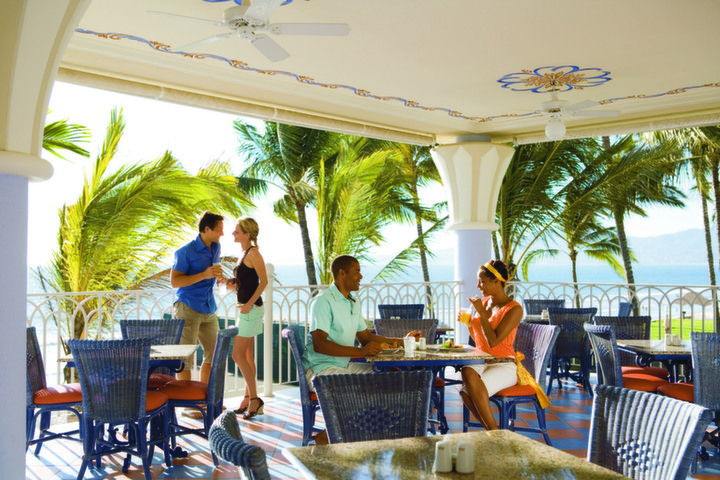 Group vacations to Puerto Vallarta would not be complete without the amenities of the RIU Vallarta, which has been a leading resort chain in Mexico for years. You can enjoy an all-inclusive spa, dance the night away at Pacha Disco, or simply lounge on the beach until the sun goes down every day, but the choice is all yours. Stop waiting for the vacation of a lifetime to be found and start discovering what the RIU Vallarta can bring you during your next beach getaway!